Making a difference A blessing came to Minjeni and Shimbwe in form of Marion from Norway. During the end of 2013 and beginning of 2014, Marion visited 303 families including 774 children. During her visits, she interviewed the families about health, home, education and family issues. With help from the village leader and a translator, she discovered that 70 new houses were in need of being built. 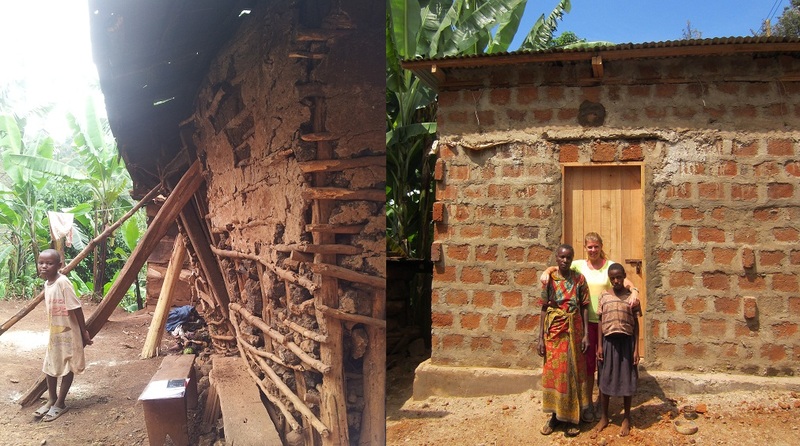 With help from family and friends Marion managed to conduct donations in which 13 new houses were built. But that was not all; she also provided beds and mattresses, provided hospital care for 10 children and adults, donated clothes, provided food, and a total 56 children and youth got their school fees paid for due Marion’s efforts. Marion returned to Shimbwe after a year and then brought back more clothes, a child’s potty toilet, toothbrushes and toothpaste. Thanks to Marion and her partner Arne the community of Shimbwe has increased their living standards and the opportunity to prosper. We are very happy and grateful for all the wonderful work that has been done for Minjeni and Shimbwe. Neema – HIV group Neema is a group of 11 women and 1 man. All of them are HIV-positive and live a stigmatized life. The group started in 2008 and the aim was to bring hope. They came together because they recognized a great ignorance in the area of Shimbwe. By talking to the ward officer and church they made it possible to have meetings where they explained the disease and talked to the church members how to make their situation better. The Neema group started to have meetings together twice a month. During these meetings, they talk about their situation and how to make it better. All the members had to give a small amount of money every time (200 TSH = 0,13 USD), this amount is now changed to 500 TSH and the group have 50 000 TSH in the bank (32 USD). This money is gathered together if someone in the group gets sick and needs healthcare at the hospital. You can say it is emergency money. The chairwomen for the group met an American woman that helped her with her chickens. The chairwomen had to promise that she would give 3 chickens to every member of the Neema group when that chicken bred. Now all of the members beside two have chickens. The chickens help the families economically in form of money for school fees, food, medicines etc. Up till now most of the group are stigmatized. The food they are selling from there garden is being rejected from there costumers or costumers come but do not pay for there groceries. This group have succeeded in the way that they have by them self started the group and the group take care of each other and are making a difference in their communities. Giving something back Suzana was living with her two children in a house that was about 2×3 meter. It was just one room and in this room, they slept and had their kitchen. It is expensive to buy mattresses in Moshi so this family slept on banana leaves with the firewood stove beside them. It was very cold on the banana leaves so they needed to put the wood on fire in the stove before they went to sleep. The smoke that came into the room was very bad for the family and the young daughter got respiratory problems. At this time Suzana was very worried about her family and felt very depressed being home. 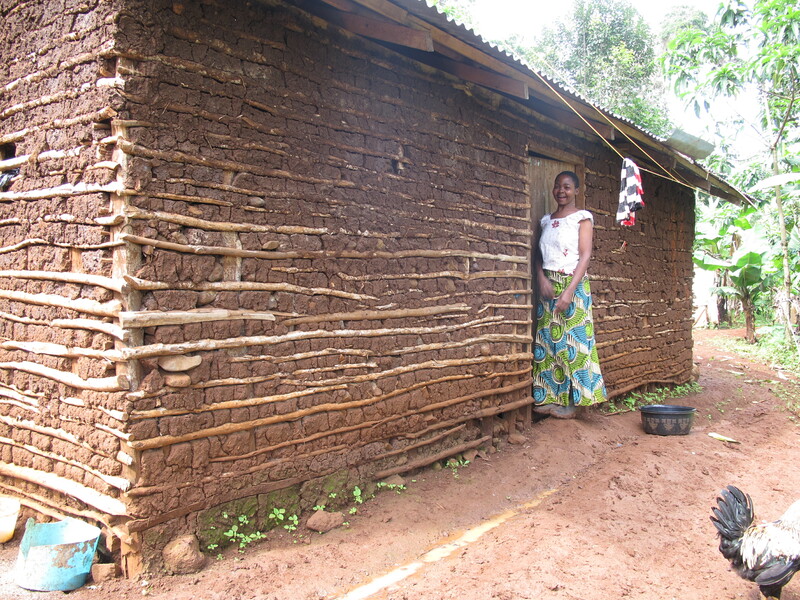 During a survey, Minjeni got to know about the family’s problems and decided to help them build a bigger house. The old house was given to Suzana from her brother that owns the land and he gave her more land for the new house. 2007 the construction started and Minjeni paid for it and a local construction worker from Shimbwe was hired. 2008 the house was ready with two bedrooms, one sitting room and a kitchen, which was the whole old house. Suzana started to volunteer for Minjeni and got some money that covered buying kerosene and cooking oil. She got more involved in the organization and became one of the first members that joined the sewing project. This generated in even more money and she was able to buy two mattresses. At this point, Suzana is also involved in the chicken project and has 6 chickens from Minjeni. The family is now very happy and got better health. Suzana’s wish now is to get into the pig project so she can afford to let her children go to secondary school. Sewing project In October 2010 four women, Minjeni members, followed a sewing seminar. Their teacher Richard A. Mngereza taught them how to make potholders, oven gloves, placemats, computer bags, book covers, purses, pen cases, toilet kits, bags, tablecloths and aprons. Minjeni did not have money to support the project so the four women borrowed money from a Minjeni volunteer. She also helped the women to sell their finished products on markets and to visitors of Moshi. After working as volunteers for about half a year the women were able to pay back the loan and started to earn money from every product. Every now and then this group of four women give a donation to Minjeni to make the organization sustain and grow. At the same time as these women started their project, Minjeni got a donation to start a new sewing project. It is called “Sewing for growing”. This project made it possible to have seminars for 20 students in sewing and 15 women and men graduated. Minjeni was also able to buy 12 sewing machines. After the seminar, the tailors were able to draw, cut and sew shirts and other clothes. The skills will be used to make for example school uniforms for the children in Shimbwe and Uru East.